Born in late 1952, my lifelong love affair with The Beatles was pre-ordained. An early sign came when, on a rainswept night in March ’63, a few pals on a council estate on the cusp of Northern Sheffield, and a West Riding village it had yet to swallow, sat on a wall, soaked to the skin and singing From Me To You at top of our voices; none of us able to say why it felt so damn good. Mum was still alive. I know this from a memory of her in stitches over a new TV comic, Bennie Hill, as guitar strumming lead singer of a group calling itself The Ants. But within weeks of our impromptu concert, rain rivulets streaking through brylcreemed hair and down cherubic faces, she took her own life. Children’s Home followed, the Beatles lighting up an otherwise complex childhood,1 their hits – unfeasibly frequent and almost always, in an era of outstanding quality, better than anyone else’s – punctuating with fine granularity its unfolding phases. Ask if it was fifteen years ago or twenty I wrote off a car on black ice between Leek and Buxton, and you’ve got me. But to this day I can tell you the difference between mid and late ’64 as that between A Hard Day’s Night and Beatles For Sale. That’s due in part to the vividity of childhood experience, in part to the fact that over those six or seven years when the Beatles reigned unchallenged – even Mick Jagger wanted to be one – not once did they cease to grow, and in that growth outdo themselves. As I wrote three years ago, as aside to a post on the Stones, “their inventiveness and creative drive – an acid fueled magical mystery tour of genre synthesis for which subsequent musicians of every stripe owe a huge debt of gratitude – surpassed all rival acts”. I might have added that the fab four exemplified perfectly (as, McCartney excepted, their post break-up careers attest) the Gestalt thing of the whole being greater than the sum of its parts. Some Beatles tunes he liked, though, and in a good mood his more than passable tenor could be heard on the corridors singing Michelle or Yesterday. Any dissonance arising from this on the one hand, on the other his assurance that “twenty years from now your own kids will know all about Bach and Beethoven but look blank at any mention of the Beatles”, was easily resolved by a claim that Lennon and McCartney could not have written such songs because “they aren’t intelligent enough”. This was at the time a popular trope. Not just that houseparent but many of his peers had been confronted with the same paradox. On the one hand pop music (like gender-appropriate hair length) stood at the frontline (pot and acid having not yet fully landed) of an intergenerational gulf of unprecedented breadth and depth.3 On the other, the toons these mopheads banged out every five minutes were pretty damn catchy. Conjuring up some faceless puppet-master in the wings was a neat way of solving the conundrum. Not least because – that Jewish hillbilly turned electric messiah4 across the pond excepted – the singer as songsmith had also not yet landed. As for that houseparent, I had the last laugh the day my twelve year old daughter wandered by the bathroom to catch me singing Drive My Car while I shaved. “I want any favours, I’ll start to scream” drew withering rebuke. That’s not how it goes! It’s ‘I wanna be famous, a star of the screen’!! As John once put it: it really doesn’t matter if I’m wrong – I’m right. Ten years on that same pesky daughter dragged me to my feet to dance at Sheffield’s Arena as Paul, with Ringo keeping time, blazed with verve immaculate through that vast back catalogue for an unforgettable three hours and then some. I never saw a chick more ecstatic. Fast forward to the early noughties. My ridiculous marriage – not her fault – was not so much on the rocks as buried by avalanche. As fifty-something birthday gift to me, and unlikely stab at disinterment and resurrection, she’d booked us a week at the refurbed Coastguard’s cottage in Alnmouth – two rooms on two levels with ocean view windows to kill for, kitchen and shower leading to bedroom and lounge by way of an open, spiralling staircase of dreamlike elegance. In the event, I’d have the place to myself, my soon-to-be-divorced pulling out amidst deepening estrangement a few weeks before our visit. In comfortable misery I’d walk the harbour town’s picturesque streets and quay, visit nearby Alnwick – home to the world’s finest second hand book store, spread over a former railway station, where I bought a pristine early hardback of Howards End – and in the half light of days fast drawing in, cook supper then slip out to the pub else curl up to watch telly. It came to pass that one such night had classical composer Howard Goodall hosting the third of a series of four programmes on popular music. The previous week had been given over to Cole Porter. Now he had four Liverpudlians in his sights. What I most remember though about that otherwise cheerless evening are two things. One is Goodall’s claim that posterity will place the Fab Four alongside Beethoven and Wagner, the other that – at a time when popular and ‘serious’ music had never been further apart, to the detriment of both – they did more than anyone else to close the gap. But judge for yourself. You do got forty-eight minutes and thirty-seven seconds to spare, right? In successive edits I’ve gone through numerous adjectives – ‘sorrowful’, ‘dismal’, ‘troubled’ – in attempted summary, on a one word ration, of my childhood. It’s not their hackneyed nature that bothers me. Truth matters far more than originality and I’ve never minded a cliché that gets the job done. But all fall wide of the mark. The conditions of my boyhood were often (not unrelievedly) lonely, bereft, confined and at times humiliating – like many childhoods of the day, when we really get down to it – but my interior landscapes nurtured a growing sense of self. There’ve been costs of course – since when did life offer free passes? – but on balance my methods – avid reading, parallel worlds painstakingly constructed and an ability to memorise, rapidly and to note/word perfection, those lifelines thrown by Stones, Animals, Kinks and above all the Fab Four – have served me well. On that last, I can to this day pass an otherwise tedious hour by playing Kind of Blue, Mozart’s Requiem or Abbey Road in my head. Fine performances they are too, even if I do say it myself as shouldn’t. Widely taken to be the earliest of the four Gospels, Mark’s words as attributed to the Nazarene – For what shall it profit a man, if he shall gain the whole world, and lose his own soul? – are echoed in Matthew 16:26. To give that older generation – its working class in particular – its due, these were men and women who’d emerged from Depression and WW2 to raise and equip their children for lives of immeasurably greater prosperity, only to see them embrace weird lifestyles and – ingrates all – damn their elders for shortcomings unfathomable. (Paul piercing in She’s Leaving Home: “… we gave her most of our lives … sacrificed most of our lives … we struggled hard all our lives to get by …“) And though I’m hardly the first to say this, to give that younger generation its due, those who judge 1964-79 a period of excruciating self indulgence aren’t conducting a fair trial without they factor in how bleak a wasteland – intellectually, culturally, spiritually, every which way – the fifties had been. Really good communicators can be prissy with it. Historian David Starkey is, as was astronomer Patrick Moore. As too were those schoolteachers most able to hold me spellbound. In the playground we’d be in stitches over their foppish mannerisms but back in class, and in their stride on what fired their passions, you’d hear a pin drop. Goodall is in that mould. I think it a byproduct of an unselfconsciousness – a shade unworldly and more than a shade uncool – so often the mark of authenticity. The public was totally unprepared for Revolver. 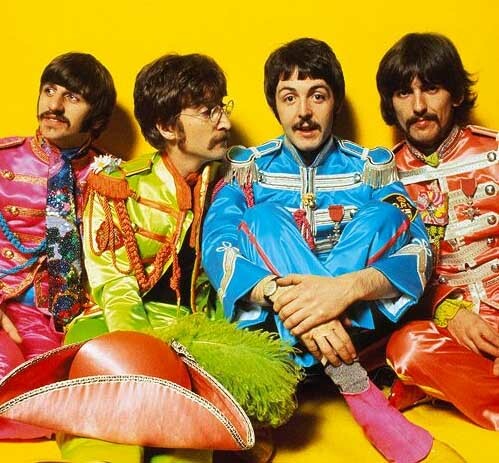 Following a superb and multi-genred but relatively conventional Rubber Soul, it marked a far greater leap into the unknown than did its more famous successor, Sergeant Pepper’s Lonely Hearts Club Band. Not even Eleanor Rigby and some of McCartney’s greatest tunes rescued its overall avant-gardness, at time of release, from public bewilderment. That registered in slow sales and I recall my disbelief at seeing Revolver – a Beatles LP – discounted in the record shops at nineteen and eleven when the going rate was thirty-two and a tanner. The best ever decade for popular music was the sixties So many memorable artists and groups and absolutely no deviation from the melodic. So much talent, the Beatles being the most talented of all. Although some of their themes suggested an acquaintance with the works of ‘the old masters, their arrangements were exceptional and original; artistry personified. I recall being totally bowled over the first time I heard Eleanor Rigby, nevertheless, it would be very difficult to choose a favourite. Thank you so much for your beautifully written thoughts and anecdotes. Good of you to say so, JT. Great post Phil and I agree with you that Howard Goodall’s analysis of the Beatles music is fascinating – particularly for a decidedly average musician like me. Back then I would have described myself as more of a Stones man, but had an inkling that the Beatles were a more complex and sophisticated outfit. Whilst I could not sing like Mick or play like Keith, I did at least know what they were doing – whilst the musical constructs of John and Paul seemed to fall just outside of my comprehension – a fact made the more maddening by the seemingly effortless and straightforwardness of their vocals. Occasionally I would look at some of their sheet music and can remember feeling mildly outraged that ‘someone’ had unnecessarily complicated the chord sequences and structures (!). Goodall has helpfully pointed out that many of the chords are common to jazz – which now begins to make some sense to the sometimes jazzer that I have become – not that this understanding would easily translate into a more competent rendition of the songs! I do not feel in a position to comment on Goodall’s assertion that the Beatles helped to drag classical music back from an atonal avant garde – but he makes a compelling argument. Cheers Bryan. Stones v Beatles was one of the great divides of our generation, no? We were all so busy positioning ourselves, unsure of who we were and insecure with it. There wasn’t always the space to acknowledge the simple truth that both were unbelievably good.